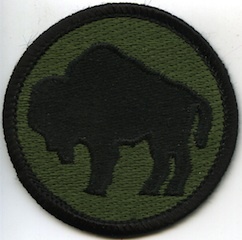 This is the official site of the 92nd Infantry (Buffalo) Division’s WWII Association as voted upon by the members of the Association. The 92nd Infantry Division was featured in Miracle at St. Anna – a 2008 movie Directed by Spike Lee and based on the novel by James McBride. While Miracle at St. Anna is a fictional account of the 92nd, it’s based on actual interviews with members of the unit. The 92nd Infantry Division was a part of the 5th Army that served in the Italian Theater during World War II. It was also the only infantry unit comprised entirely of African Americans, or, as they were referred to at the time – Colored Troops, to see combat in Europe. During their time in Italy, from August of 1944 through the end of the war in May 1945, the 92nd advanced more than 3,000 square miles and captured more than 20,000 German prisoners. They also suffered heavy casualties – with more than a quarter of the unit killed or wounded in action. For their Deeds the 92nd earned more than 12,000 decorations and citations – including two Medals of Honor. This site is intended to serve as a resource for those who wish to know more about the organization. Navigate through the sidebar at the left for links to resources about the Buffalo Soldiers of the 92nd Infantry Division. Watch the video below for a brief overview about African Americans serving in the military.